You might as well make some of the LU routes if not in the process already. The S7 stock. Current king of the Subsurface lines in London (and would do well in Rijndam and on Simvliet line C too ). Also in development (not finished yet) for the next version. This weekend I plan to start on the hardest part; making a functional drivers cab. HOLY DEAM! that baby looks great! The new London-trains look so beautiful! Thanks Sjoerd! A good idea would be the London Underground Subsurface Lines (Circle, Metropolitan, Hammersmith and City, District) becuase there are many trains you can run on it! As well as many routes and service patterns. Now just the C stock. 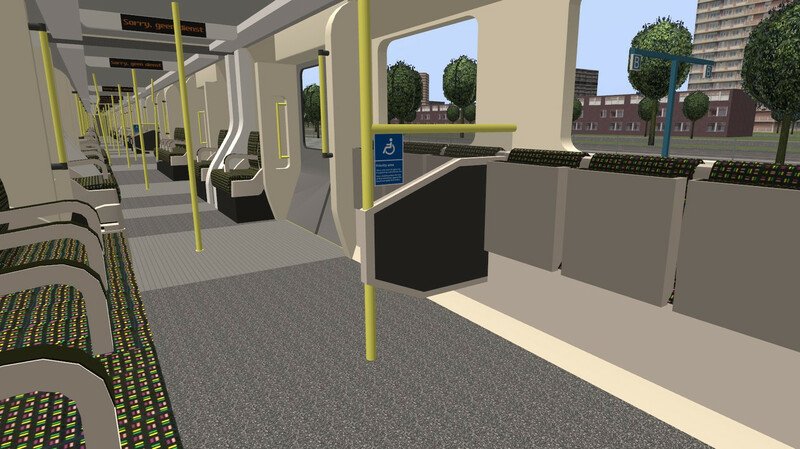 The 4th and 5th carriages have been fitted with places for wheelchairs. These seats must be given up if required by a wheelchair user. Users should position the rear of their wheelchair against this board and apply their brakes. Does that mean that more metro stations will soon have elevators or will no one ever have to give up their seat? Should I decide to do a next Rijndam version in the future, I'll have to add lifts to most stations.